Yesterday Alex and I completed two trails that I have hiked on probably a hundred times over the last 12 years, but never in their entirety. The Bryce Path climbs from scenic pathways around Echo Lake State Park 1,120 feet in 1 mile before, reaching the top of Cathedral Ledge. The Whitehorse Ledge Trail allows you to loop over the top of Whitehorse, out towards the Moats, and back around the base below the South Buttress for a 3.8 mile loop hike with over 1,600 feet of elevation gain in total. The reason I have spent so much time on this trail without actually completing it is the lower portion of the Bryce Path is the regular descent route after finishing a technical climb on the Whitehorse Ledge Slabs. I am not alone in overlooking this great hike in our backyard, as two regular climbers I bumped into in town today both responded to my plans with “Bryce Path, where’s that?”. 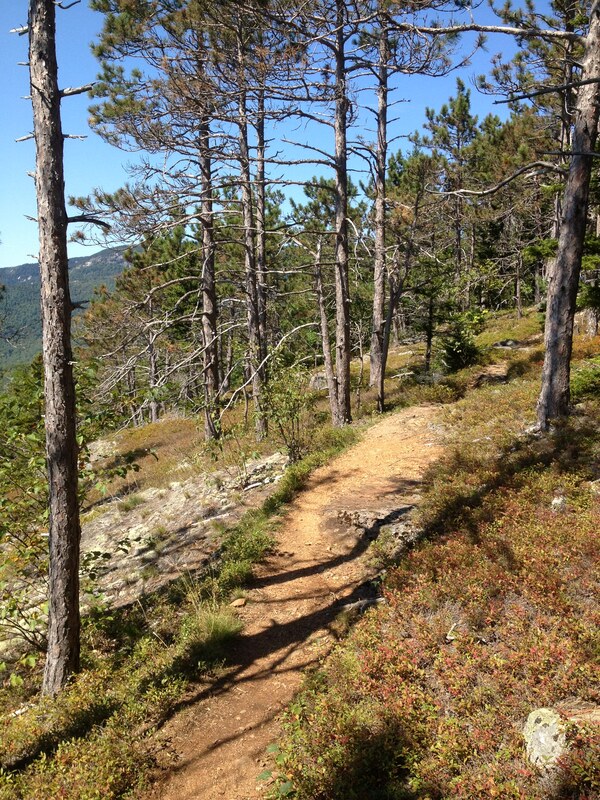 “Oh, the descent trail off Whitehorse? That goes all the way around doesn’t it?” One of them has climbed on these cliffs for 20+ years! 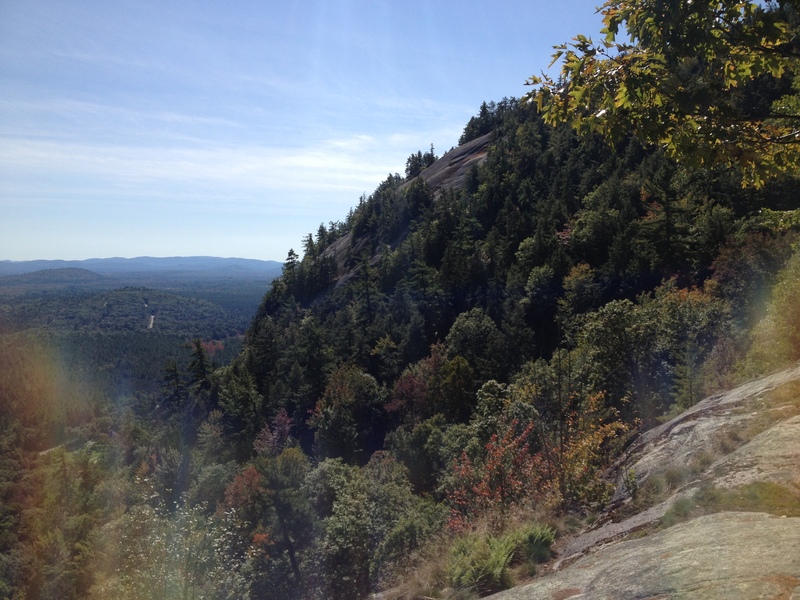 We left the lot at 10:41am and climbed quickly to the col between the two well known ledges. Throughout the climb I noticed how unfamiliar this trail looked going up it, despite the dozens of times I had come down it after completing a rock climb. 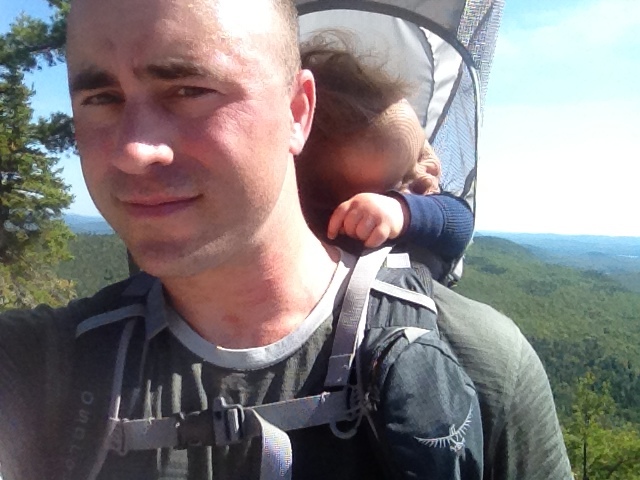 At a juncture I turned right to head up to Cathedral Ledge, and minutes later Alex slipped off to sleep. He was probably still beat from his long birthday weekend with more friends & family stopping by to see him than we could keep track of! We had only left the car 35 minutes ago when we topped out on Cathedral. Book time was (cough) 50 minutes by the way (cough). We reversed our direction and dropped back down into the woods. 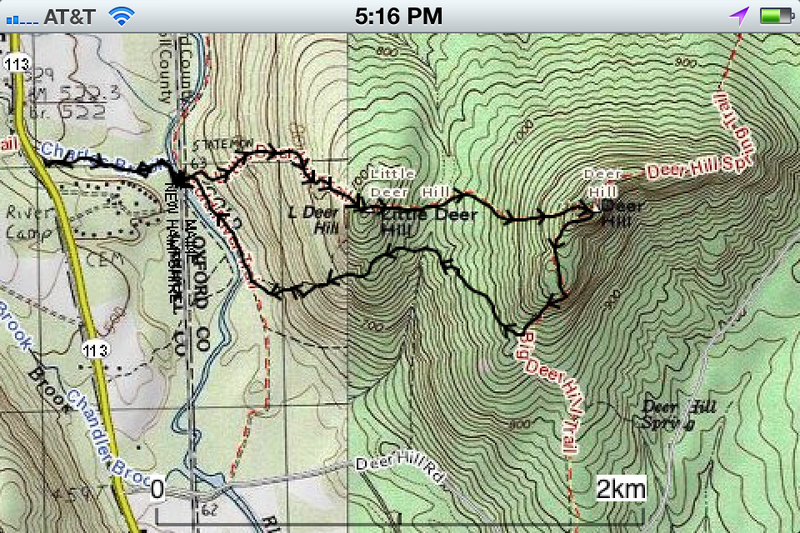 After a short descent we left the Bryce Path and picked up the Whitehorse Ledge Trail. A few minutes later Alex awoke and decided it was time to get out of the carrier. 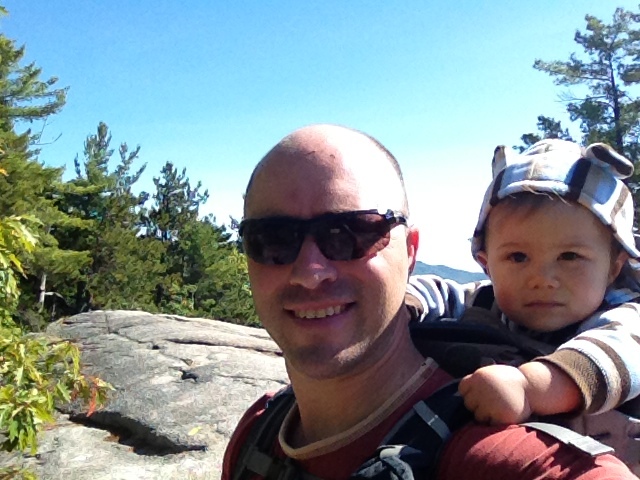 I tried to convince him the flat, sunny, summit rocks of Whitehorse, only 10 minutes away, would be a much nicer (and cleaner) place for a diaper change and snack but he wasn’t hearing it. 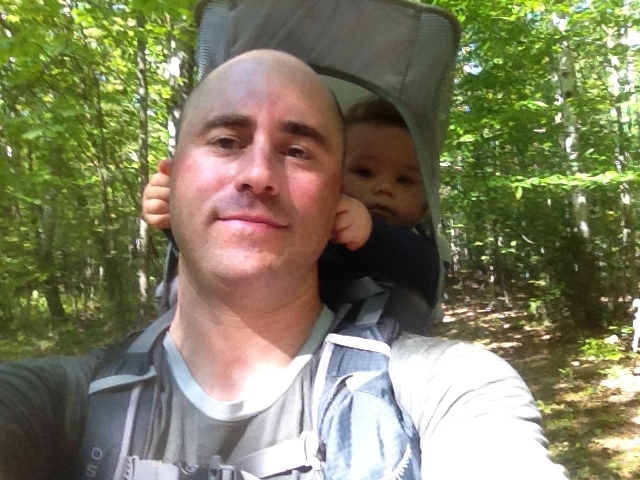 We pulled off the trail and took 5 to 10 minutes to stretch, snack a little, and get a dry diaper on. Alex made sure he had as many pine-needles as he could get his hands on in every crevice by the time I was getting him back into the pack. Just around the corner we got our first view of the summit slabs of Whitehorse, where a few days earlier I had a great day climbing with a new client. 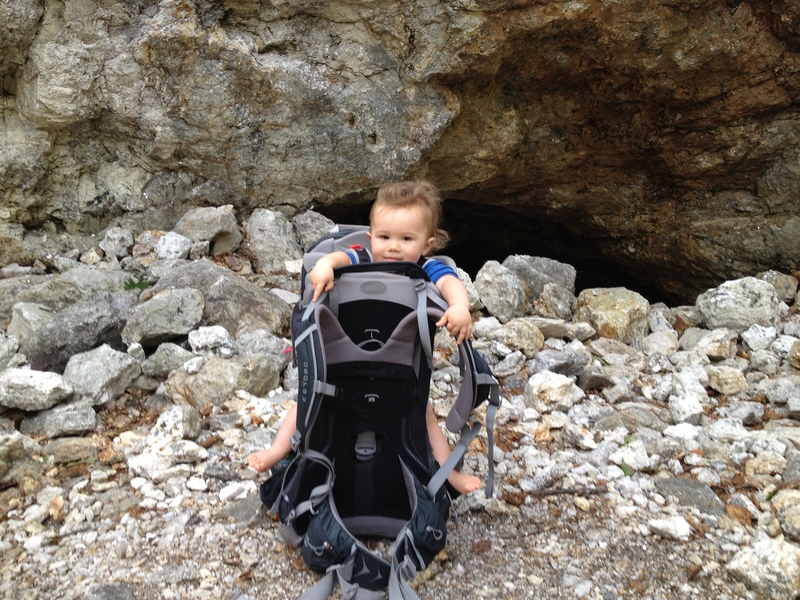 We soon reached the flat open summit ledges and Alex perked up at the change in scenery (or maybe the dry diaper). We made out way down the backside of the mountain with some fine views towards the Moats and after passing the Red Ridge Link Trail Alex started to get fussy again. He seemed to notice when I took a sip from my CamelBak tube so I decided to experiment and passed it back to him. He instantly starting gulping down some of the 100 ounces of water I was carrying. At first I was impressed he knew how to work the mouthpiece to get the water running, but then I realized this was probably way easier than learning how to “latch” the first couple weeks of his life. One issue I had was I couldn’t monitor how much water he was taking, and I was concerned he would either drink to much, or pull off the mouth-piece which could be a choking hazard. I was embarrassed to realize I didn’t know if a 1 year old (as of yesterday) was supposed to drink water. We gave him plenty of formula, breast milk, and occasionally watered down low-sugar kids apple juice, but never just plain water. And while some reading this right now may shake their heads at this technological invasion during this great nature hike I noticed I had 4G coverage on my iPhone and asked Siri if my 1 year old should drink water. Slowing my pace, I quickly read that some water was fine and decided I wouldn’t continue reading what 8 other websites had to say on the subject. The kid was thirsty, and the CamelBak tube was relaxing him. I checked to make sure the BiteValve was on as tight as it could be, and we continued our descent. 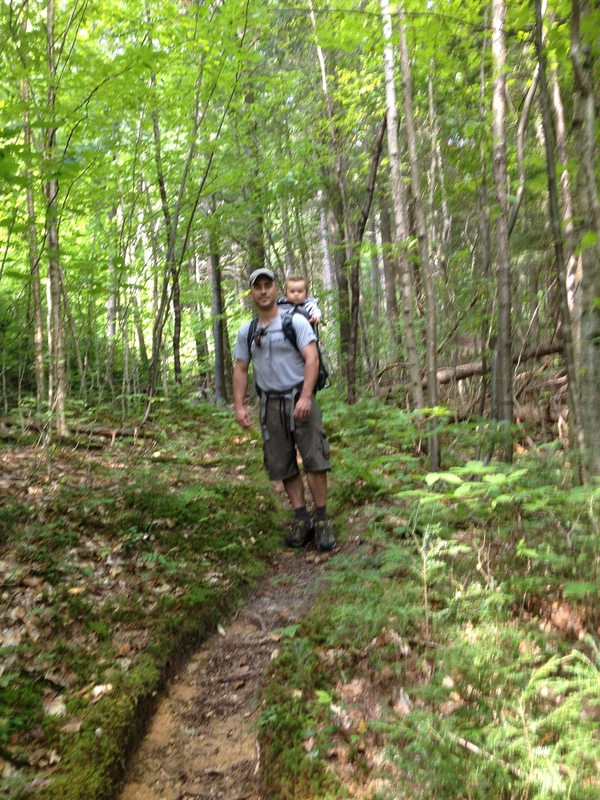 I’m not a very OCD type parent, but I do like to monitor how much he eats and drinks while we are on the trail. With the cooler Fall temperatures we loose more moisture through respiration than in the humid summer months, so fluid intake should go up. Dehydration has the same symptoms in adults as it has in children. The first thing to observe is the color of urine. Here, diapers are a blessing, as it is very easy to see if you’re diaper wearing kiddo is dehydrated when changing them. Dark or smelly urine is a clear sign of dehydration. A nice heavy wet diaper that is barely yellow is a great sign that he has been getting enough fluids, but during this transitional time (infant to toddler) be sure they’re getting some potassium/sodium in their daily diet. 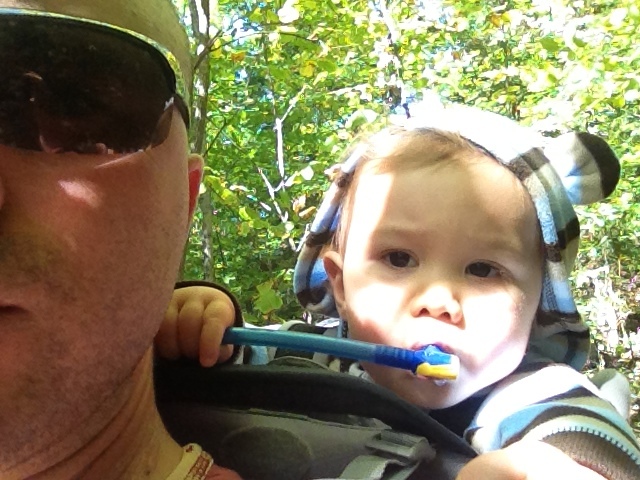 I attributed Alex’s previous fussiness to minor dehydration, because after 10 minutes of sipping on the CamelBak he was happy as a lamb for the last 15 minutes of the hike back to the car. We reached the car exactly 2 hours and 10 minutes from starting the hike. Book time was (cough) 3 hours, 5 minutes (cough). I’ve been a bit enamored with the whole southern area of Evans Notch lately driving up Rt 113 at least once a week for quick hikes with Alex. I really prefer loop hikes when ever possible, and today I choose the Shell Pond Loop, just north of the last 3 hikes I have done with Alex. We left the very familiar Deer Hill Rd around 11am and followed the gentle descending Shell Pond Trail until reaching the loop in .9 miles. I took a left so I could follow the loop clockwise as it would give me an easy option after an hour to either just finish the Shell Pond Loop for a mellow hike, or add a loop up and over Blueberry Mountain for something a bit more challenging. 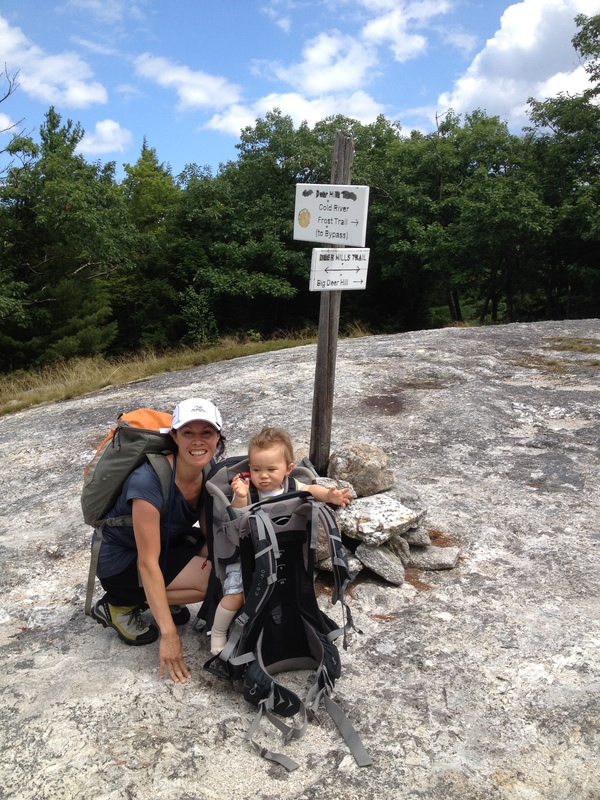 We reached the far end of the Shell Pond loop in just under an hour. 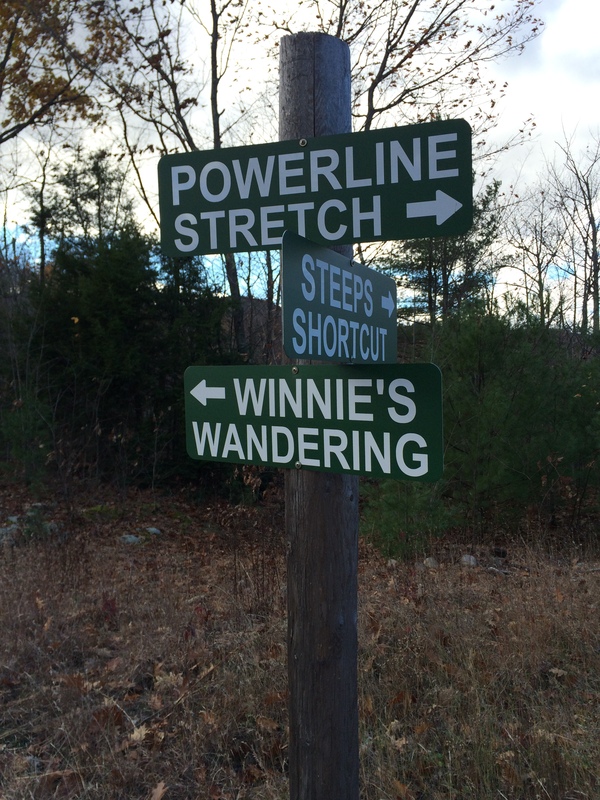 Here, after crossing the outlet and getting to Stone House Rd we had a decision to make. 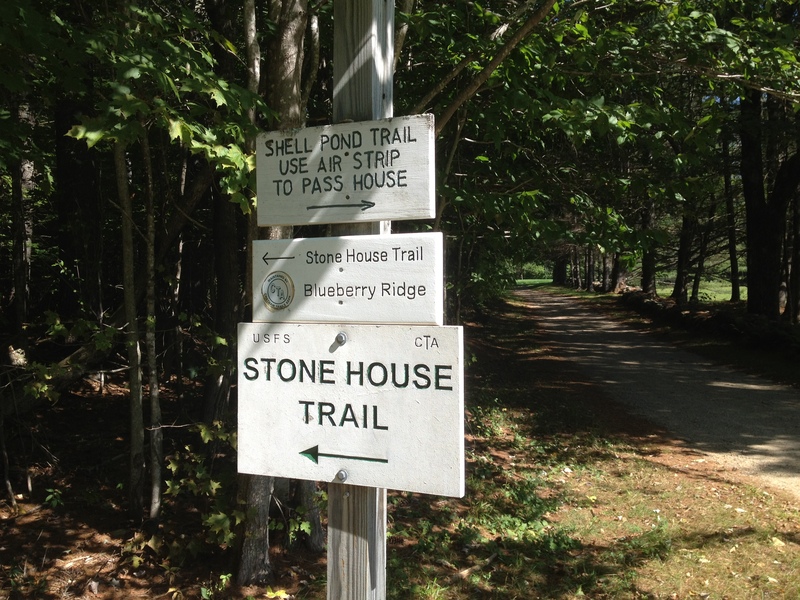 Return to the car along the north side of Shell Pond and call it an easy 3 miles, or head up the White Cairn Trail to summit Blueberry Mountain (elev 1781) and return back to the Shell Pond trail via the Stone House trail, lengthening our loop by 4 miles and over 1,000 feet of climbing. 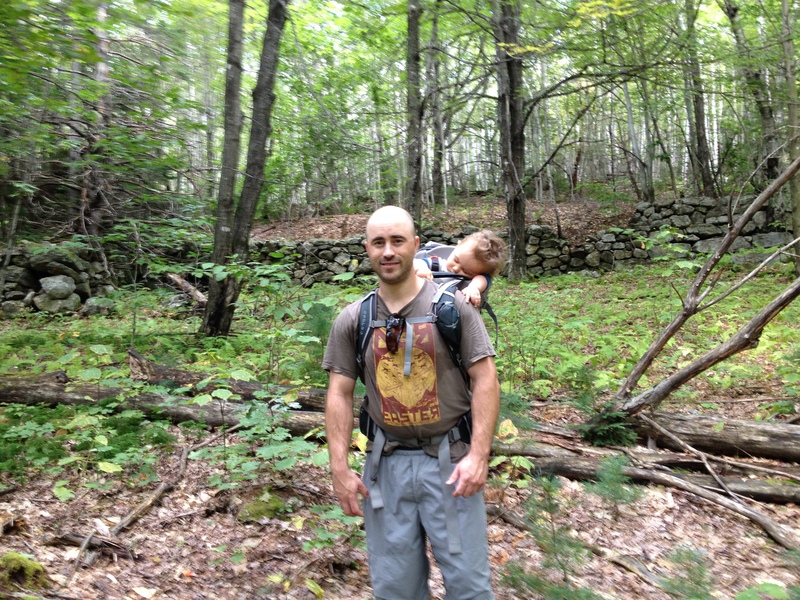 After a short stop to get Alex out of the carrier for a minute I decided it was a perfect day to continue hiking, so we headed north on the White Cairn Trail. Soon the trail started to climb, but I kept my pace at a quick clip feeling rather strong after snapping into a Slim Jim. After a steady half mile we hit the steeps. Beautiful stone steps had been cut and placed well on ascending the ridge. 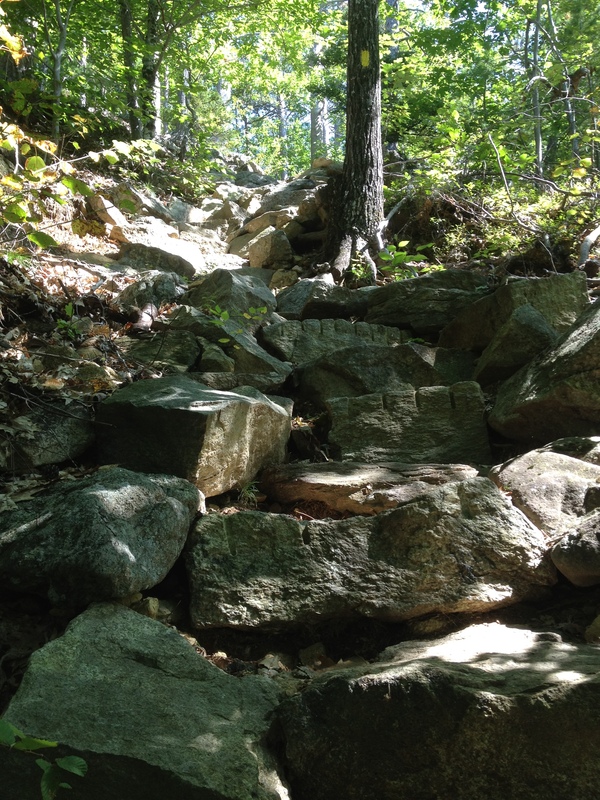 It was an impressive bit of trail work, and I decided to count them as I climbed. After 102 steps I reached a small plateau. From here the trail continued to rise, at a less dramatic angle, and the trees began to grow apart offering views to the north-west of Basin Pond, to the west of the almost ever present Baldfaces, and the south-west to the Chatham/Fryburg farms I had become accustomed to driving by these last few weeks. And then we came across this sign. 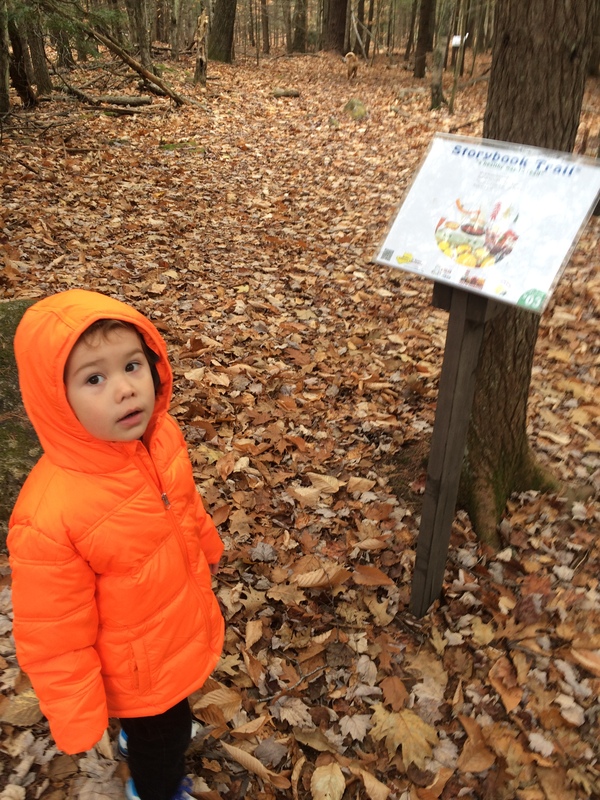 Without realizing it this would be Alex’s first trip into official “wilderness” as designated by Congress in 1990. 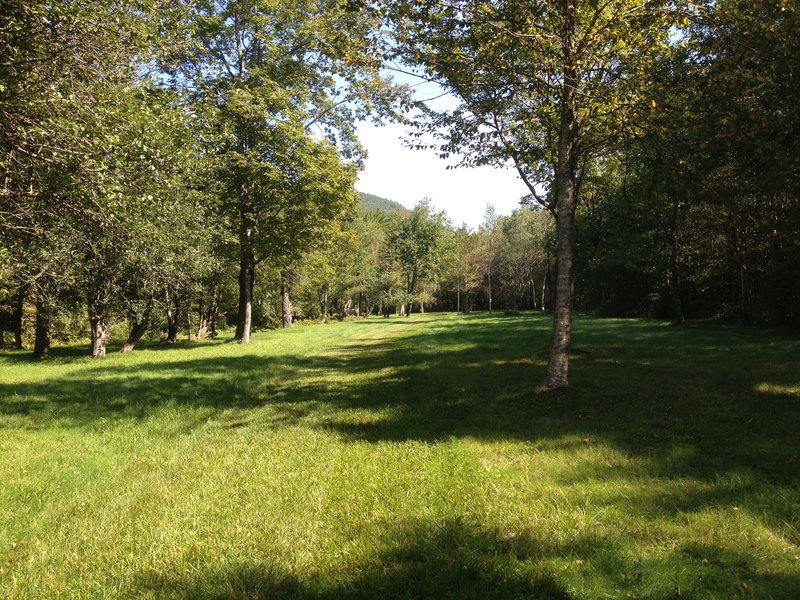 More than 11,000 acres in size, we would just brush through the far southern tip of the Caribou Specked Mountains Wilderness Area. The realization of another milestone for Alex rejuvenated me and I continued along at a fairly quick pace. 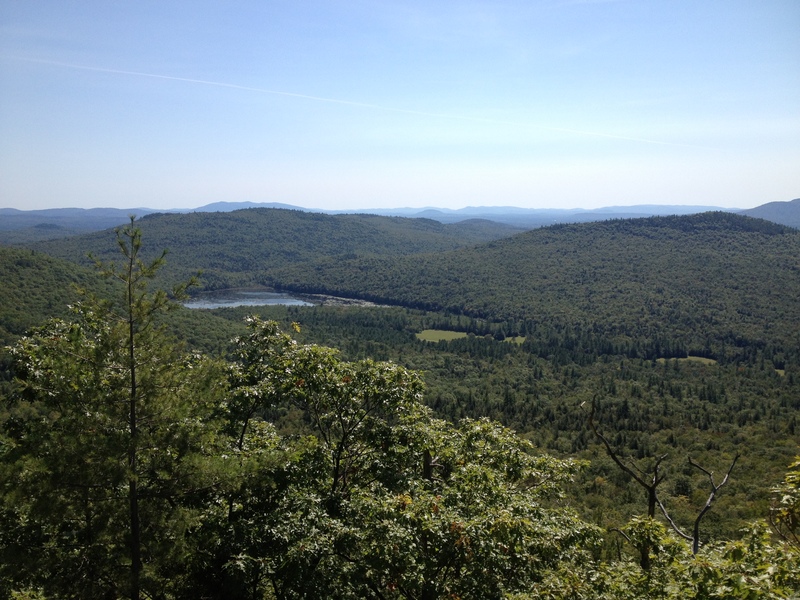 We soon reached the Blueberry Ridge trail, and after taking a right we came to a small scenic loop trail that left the ridge trail to take in the views to the south above some ledges, and tag the official Blueberry Mountain summit. Just before reconnecting with the Blueberry Ridge Trail I heard the 1st voices of the day, and seconds later two women came into view around a bend. Alex awoke to hearing something other than his dad’s breathing and we stopped to chat briefly. They had some polite questions about Alex’s hiking experience and were happy to hear he had over a dozen hikes under his sunshade. 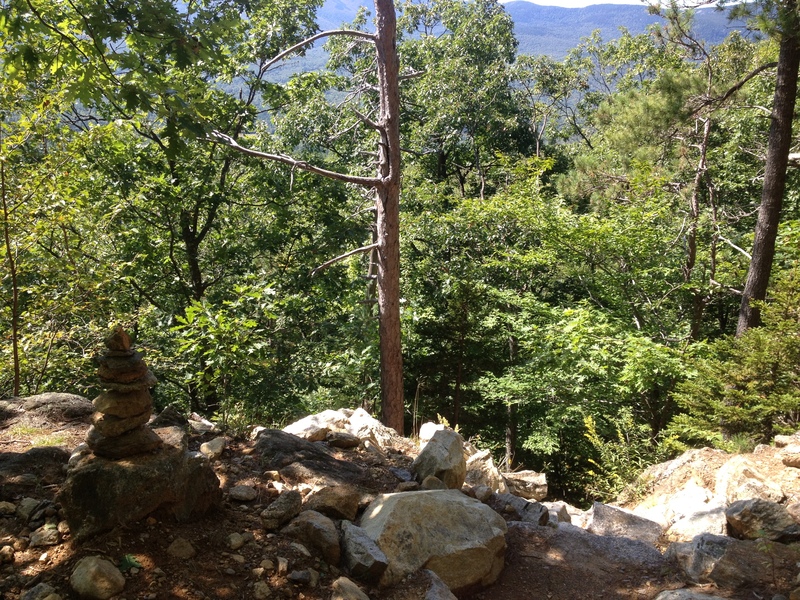 After bidding good day we reconnected with the ridge trail and almost immediately took a right on the Stone House trail and started our descent, moderate at first, then steadying out as the trail widened to what was probably a logging road at some point. We passed a small side path with a sign that indicated “Rattlesnake Pool”. While intriguing, I was starting to feel pressed for time and not knowing how far this pool was I decided to save it for a return trip. A minute or two later we reached a sign for “Rattlesnake Gorge”. This was visible from the sign so I headed over to investigate. Here, Rattlesnake brook carved a nice deep gorge reminiscent of “The Flume” just south of Franconia Notch, but in a slightly more modest scale. There were enticing swimming holes both up and down steam of the bridge I was standing on, but again, being pressed from time, I would not get to sample them. 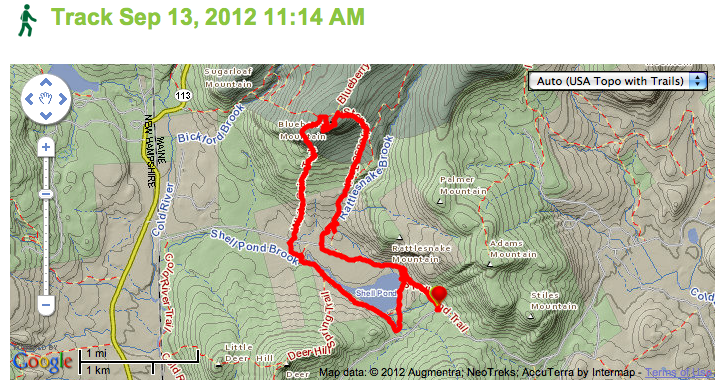 Here I consulted the map and saw two short trails leading down to Shell Pond Road and my return to the trail-head. I chose the shorter of the two, and after 200 yards or so came to a “No trespassing sign”. Despite knowing it would be a short cut down to a more “allowed” area I did not want to offend any land owners, so I turned around and hiked back up to the trail junction and took the other leg down to the road. 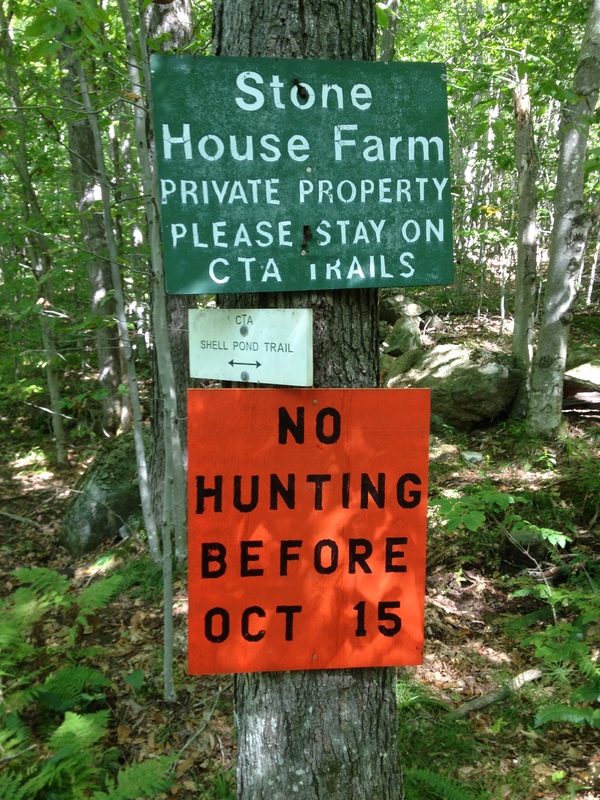 We got back to the Stone House Rd without running into any more trespassing signs and made our way out onto the dirt air strip that was the polite way around the privately owned (and lived in I believe) “stone house”. I would like to know more of the history of that place as it is incredibly idealistic and scenic. As we near the end of our hike I start to slow down a bit. 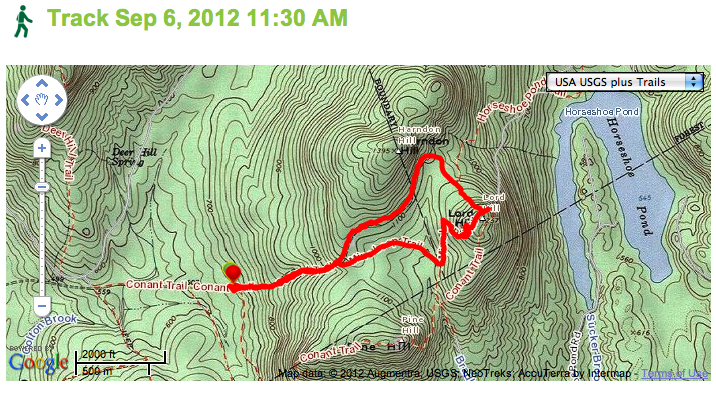 We’ve gone 6 miles with over 1,000 feet of climbing up, and down, in just under 3 hours, and we still have a mile left. Alex, now awake, sensed my relaxed pace and discovered he could reach my ears. Grabbing hold of each like a jockey grabs the reins he found it hysterical he could control which way I looked. We reach the car just as Alex is ready to flat out demand a bottle and check another trail off the map. 7.21 miles is the final odometer reading, 3hrs and 29 minutes of travel time. My iPhone App calculates an average speed of 2.07mph. Considering the elevation involved I’m quite happy with that. I wonder how I’ll do when he weighs 30 lbs though, as this kid is growing fast! 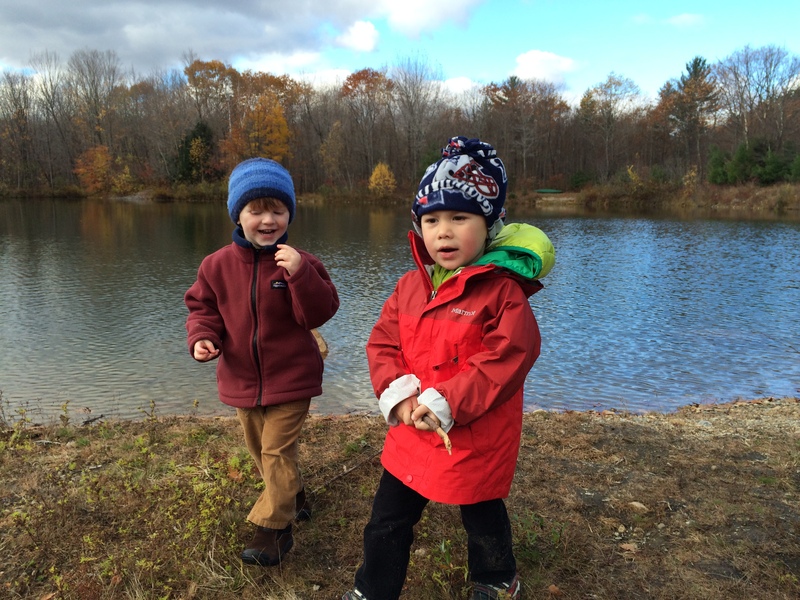 The Shell Pond Loop is a real gem for families with small kids. Scenic, gentle, and filled with nice views and interesting flora/fauna I’m sure we’ll return here at some point. 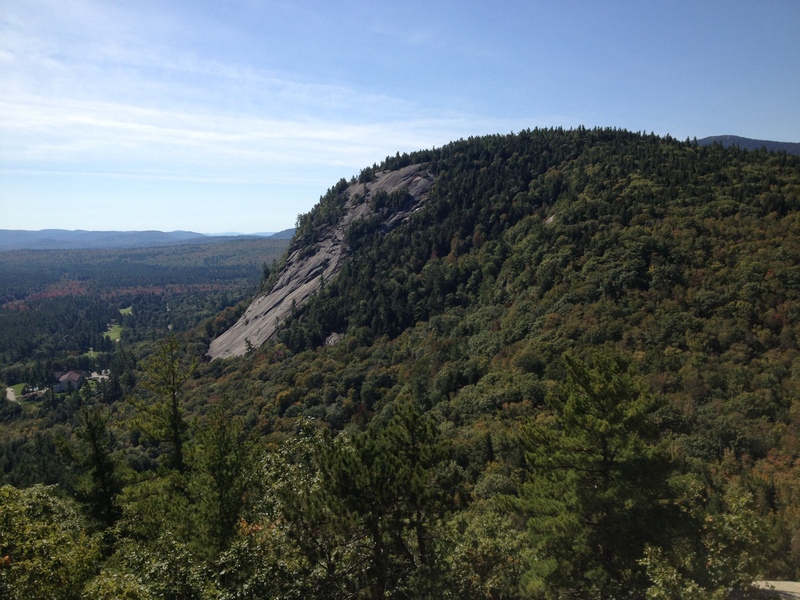 While the summit of Blueberry Mountain is not striking, and somewhat dwarfed by the nearby 4000 footers, it’s ecologically impressive and technically it is a wilderness area. 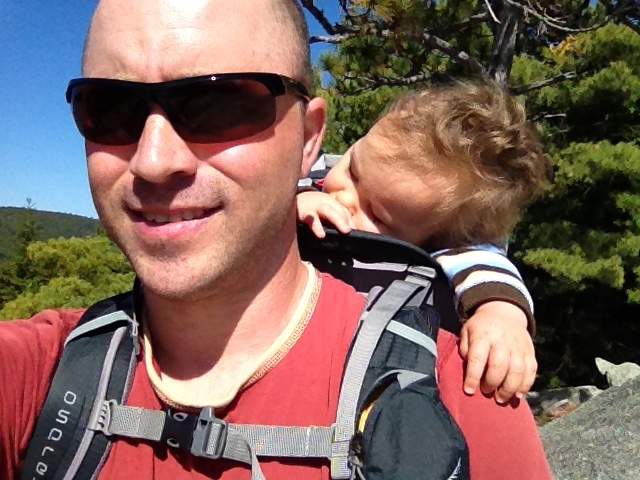 Definitely a great hike for a family to knock out in a day. 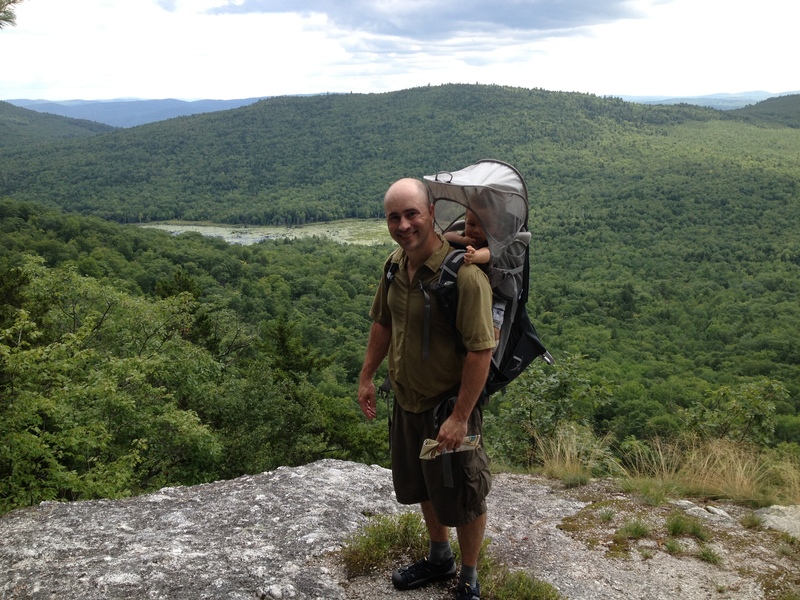 Today Alex and I joined Rob and Lhotse for another hike in the Deer Hill area of Chatham, NH. 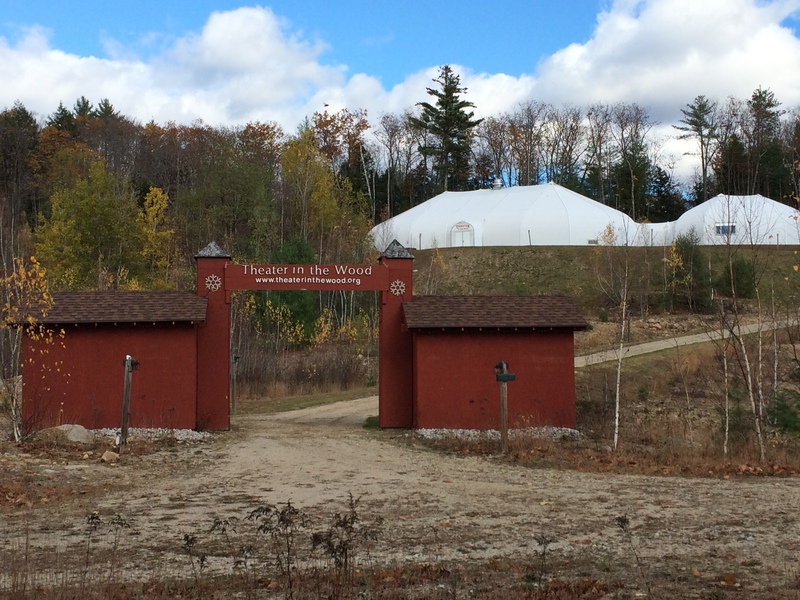 Our recent visit to Deer Hill Spring had sparked our curiosity about the nearby mineral sites and the White Mountain Trail Guide spoke of an old mica mine in the vicinity, up on Lord Hill. Despite the guidebook’s suggestion of parking back on FR9 we followed a somewhat washed out dirt road for a half mile or so, over a dike, and past some interesting looking camps, until we reached a point where the road steepened and would require more than 4WD to ascend. We parked, and started ascending an old washed out dirt road rather steeply, for not having warmed up at all, and soon came to a sign forbidding wheeled traffic. 5 minutes later we took a right at the split where the Old Mine Loop Trail climbed up onto a short ridge and leveled out. The next half mile went quick as we passed through an interesting area with a wet bog-ish forest on our left, reminiscent of a scene from the Neverending Story, and a more open pine forest on our right. The trail here was almost level, and I suspected a very old railroad may have been here at some point. 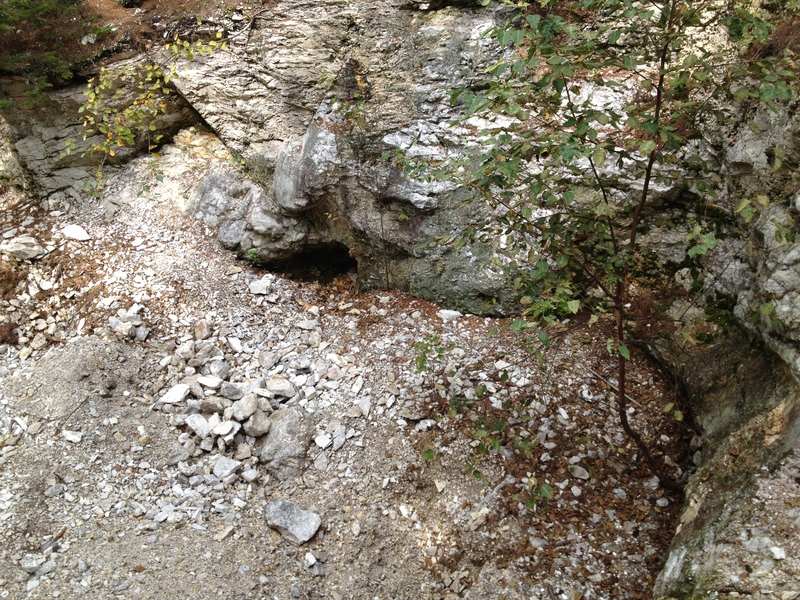 We took a sharp left on what some maps label “Old Mine Road”, and quickly started noticing large quartz rocks scattered over the trail. Each time we thought we found one worthy of carrying home we found another twice as big, or twice as clear, or twice as smooth, than the one in our hand. Our packs started to get a little heavier. We hadn’t heard a sound, other than Lhotse’s panting, or Alex’s coo’ing, for quite sometime, when we heard a distant metallic clank. “Did you hear that?” Rob asked. 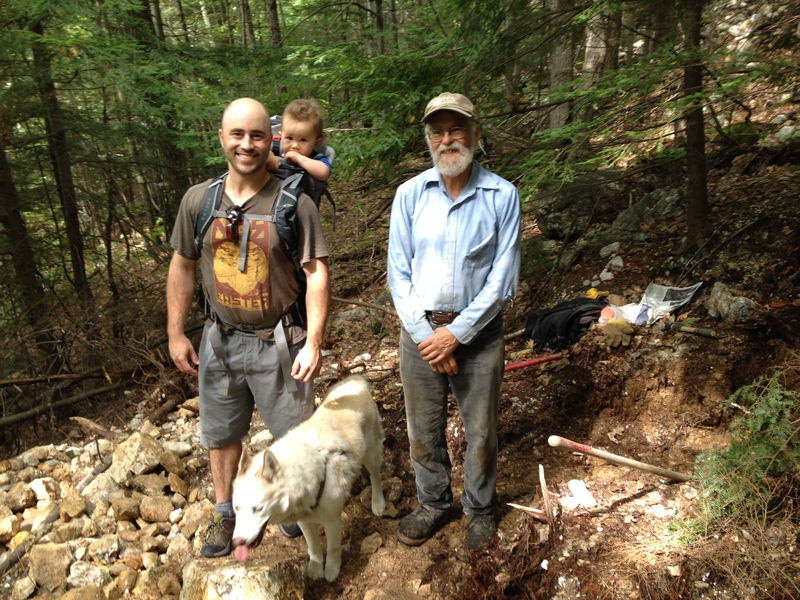 “Why yes”, he said, and we made our way over to his tilling pile and the hole in the earth he had been toiling at. As he laid his tools down I took a inventory of him. Here was an older gentleman, retired I would soon discover, with a formidable white beard, friendly toothy smile, darkened skin, hands that showed a lifetime of hard work, practical glasses, button down collared shirt, and belted jeans covered in dirt, wearing a Sierra Club ballcap. A true “Mainer” and mountain man in my opinion, and I mean that in the most respectful way! He was happy to answer my tirade of questions about his hobby. We spoke for 20 minutes or so, asking him about the tools he was using, the types of rocks and crystals one could pull from these areas, the best thing he’s ever found, and how one could get started in this hobby. After learning of local mining hobbyist groups we said a farewell, but first Rob snapped this picture. We carried on up the hill, adding specimens of Quartz and Mica to our packs as we went, trying to remember the names of at least some of the minerals and gems Doug had told us could be found out here. Only 100 yards away we found the two larger “open pit” mines that had been picked quite clean according to Doug. 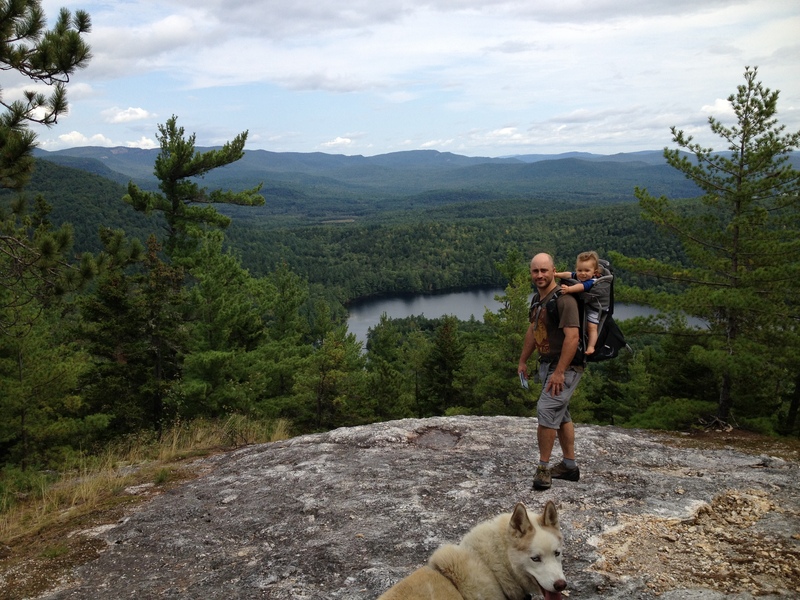 After adding yet more rocks to our packs… my own was getting quite heavy, we made our way up to the small summit of Lord Hill (1,257ft). 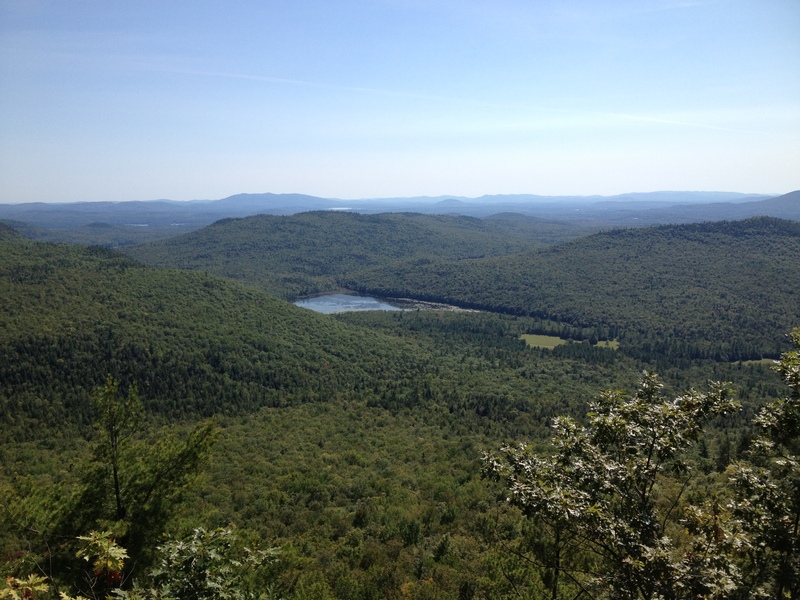 A short distance off the summit afforded an excellent view to the west that included the aptly named Horseshoe Pond and the intriguing far off Square Dock Mountain. Following the northern part of the Conant Loop trail we descended, passed through a gap in an old stone wall, and paused only once at an very old, ancient it seemed, large cellar hole. Alex, it appeared, had already seen enough interesting things on this hike. We completed the 3.3 mile loop in just 2 hours flat, which was pretty good considering the 30+ minutes we spent exploring the mining area. 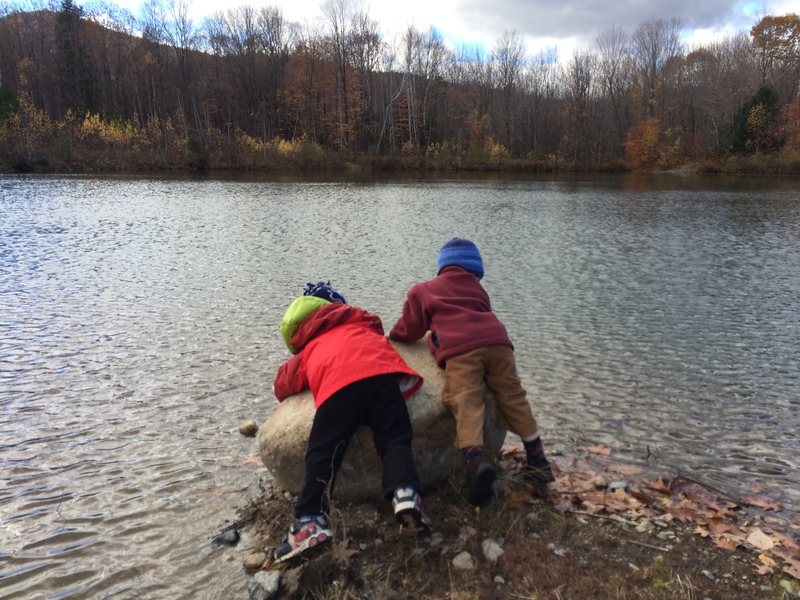 Our conversation with Doug had solidified my idea that hunting for semi-precious stones with Alex when he is older would make for some great trips to cool spots in the mountains. As Doug had explained, the memory of the occasional great find of a rare gem will fuel you for years as you toil in a hole looking for the next rare gem. Recreational mining, or rock collecting, is definitely a unique pursuit. 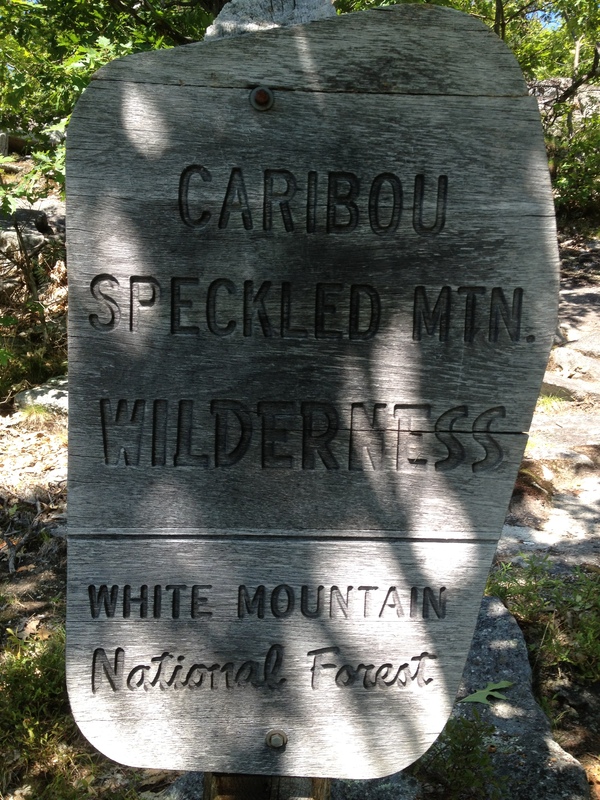 I’ve certainly become more aware of it’s presence lately in the White Mountains. Indeed, it seems every hike we go on it isn’t long after leaving the trail-head that I realize it is always worth the effort to be out here with Alex, no matter what we are doing. A couple weeks ago when Michelle, Alex, and I climbed Little and Big Deer Hill we saw this spring on the map and wanted to investigate it, but some threatening clouds had us finishing the loop hike we were on without any detours. I had a couple of free hours yesterday so Alex and I got out for a short but fun hike with longtime friend Rob and his canine companion Lhotse. I love heading to this area. 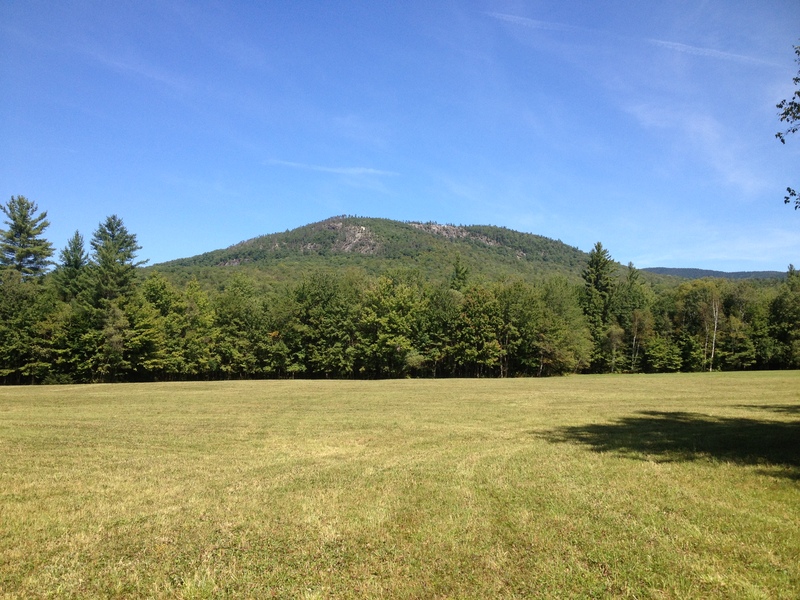 The drive from Conway up Rt 302, to Rt 5 in Fryeburg, then over Fish St to get to 113, to a point just south of Evans Notch is incredibly scenic. To the west the backside of the Green Hills Preserve lead up to the very visible fire tower on Mt. Kearsarge. More to the north Middle Carter occasionally pokes her pointed head up behind the scenic Bald Faces, and all the while you’re driving though some of the most fertile flat farm land with beautiful huge active farm houses that just scream “Americana” to me. It’s no wonder why I see so many cyclists enjoying this stretch of Rt 113 almost every time I drive it. After locating the trail head we set off for our short stroll. It was good to catch up with a friend I hadn’t seen in awhile, and Alex hummed and coo’d after recovering from the surprise lick from Lhotse at the parking lot. 25 minutes into the hike we reached the spur path that would take us down to the spring, that, according to to the guidebook was “a shallow pool with air bubbles rising through a small area of light-colored sand”. It was this description that had peaked my attention, and I wasn’t disappointed. Rob and I wondered what would happen if someone stood in the soft sand and as I expected Rob was quickly removing his shoes to find out. The experiment proved that what looks like quicksand acts like quicksand, and Rob had the foresight to only go to the calf before pulling his leg (forcefully), back out. A future Darwin Award avoided, we headed back up the spur path to return to the car. 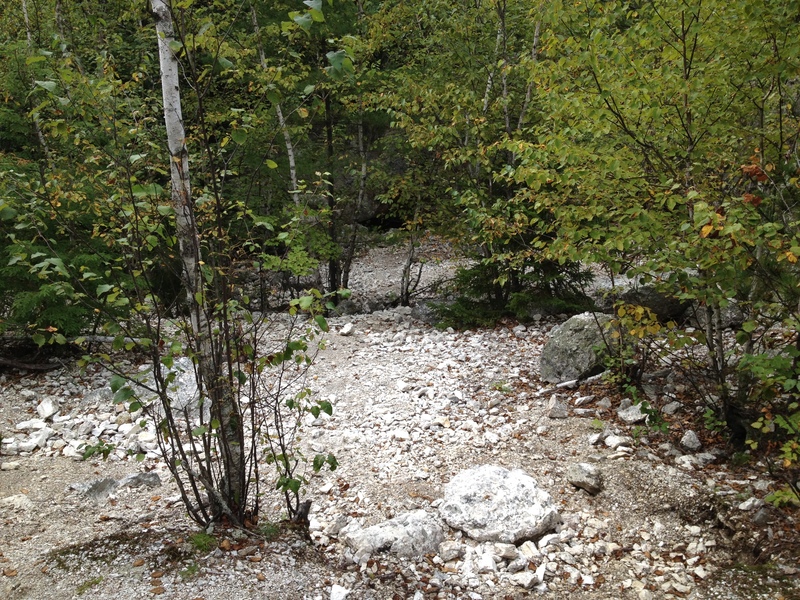 Along the way I started noticing interesting bits of quartz, mica, and perhaps feldspar scattered in the forest duff. 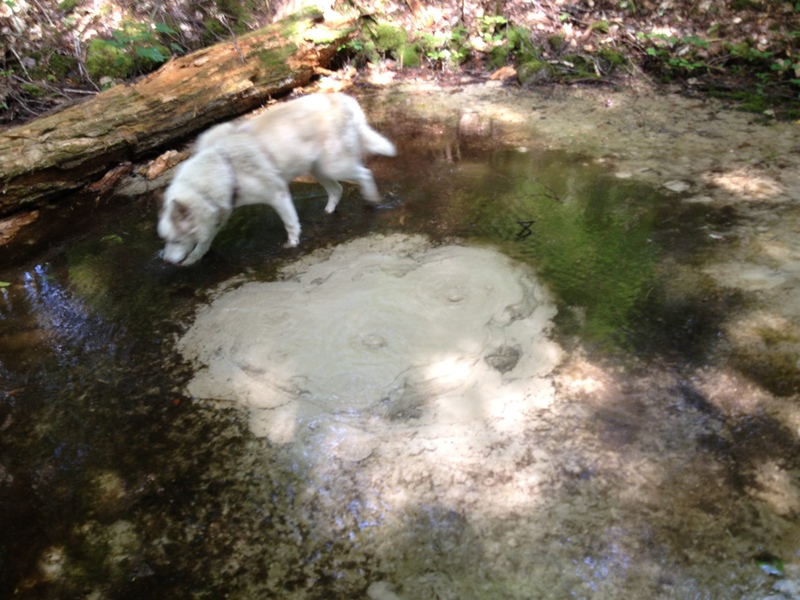 I knew there was an old mica mine nearby and started making plans to explore that on my next trip. After returning to the car we drove further up Deer Hill Rd to look around a bit and located a USFS kiosk with directions to a nearby recreational mining area. When Alex is a bit older I think we’ll have a few family outings to collect some of the semi-precious stones (where legal) from the WMNF. I’m sure the folks at Donero’s Rock Shop in North Conway will know how to get us started! 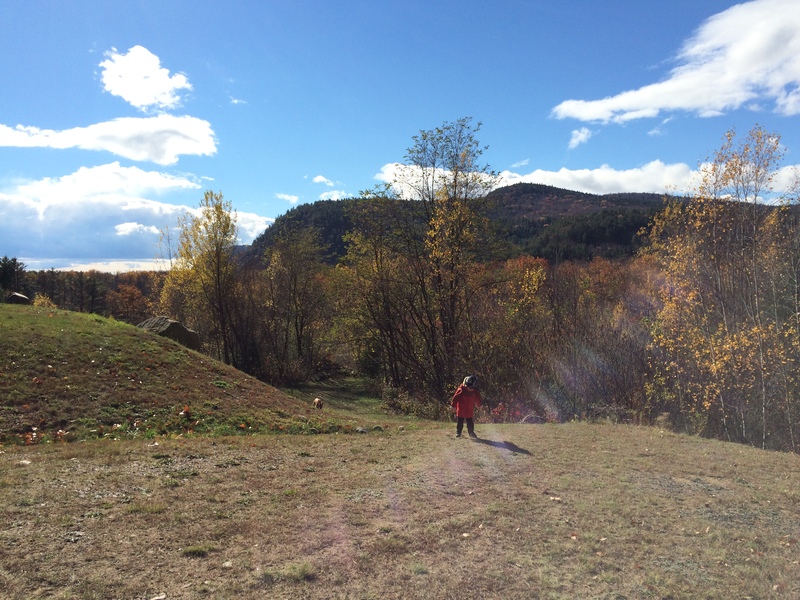 Michelle had the day off today after working over the weekend so we took advantage of the blue skies following a few low pressure system induced storms that have swept through the area over the last few days to get out for a full family hike. 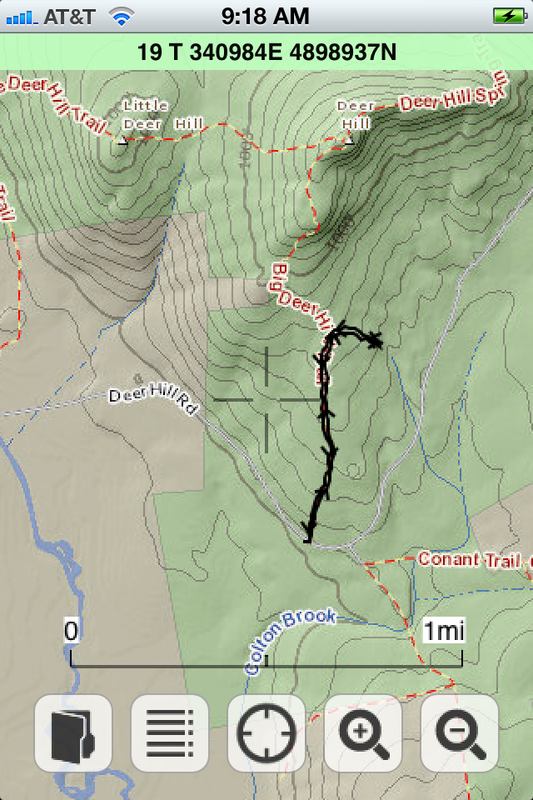 Browsing the map for a 2+ hour hike that neither of us had done before I came up with Little & Big Deer Hill, near the southern end of scenic Evans Notch. This loop promised some cool views of North and South Baldface, a loop hike Michelle and I did back when we were just dating. As expected Alex was fast asleep when we arrived at the parking lot, the same we used when hiking the Baldfaces years before. 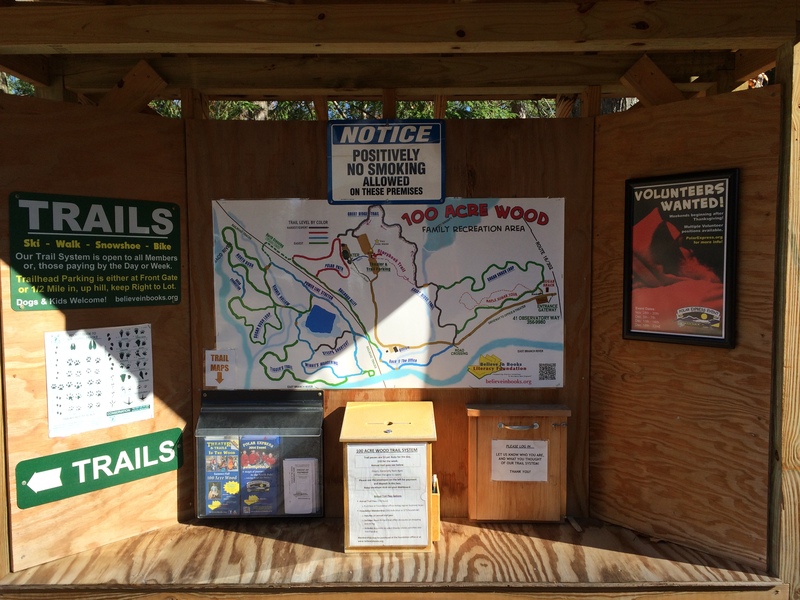 We organized our packs and glanced at the kiosk map while waiting for him to wake. With the car off and sounds of nearby hikers it took less than five minutes for him to start blinking, and we loaded him into the backpack. 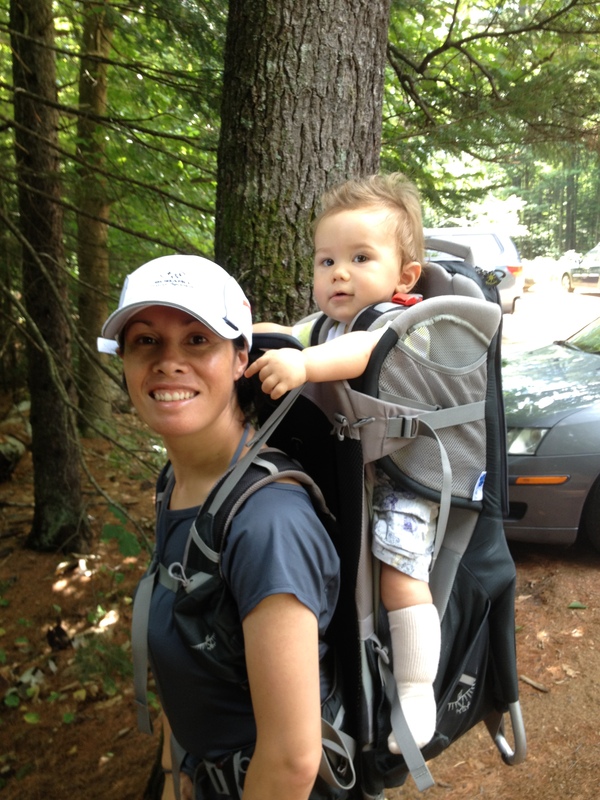 Michelle had not yet carried him and was eager to, so we adjusted the torso size of the back down to fit her and loaded up. 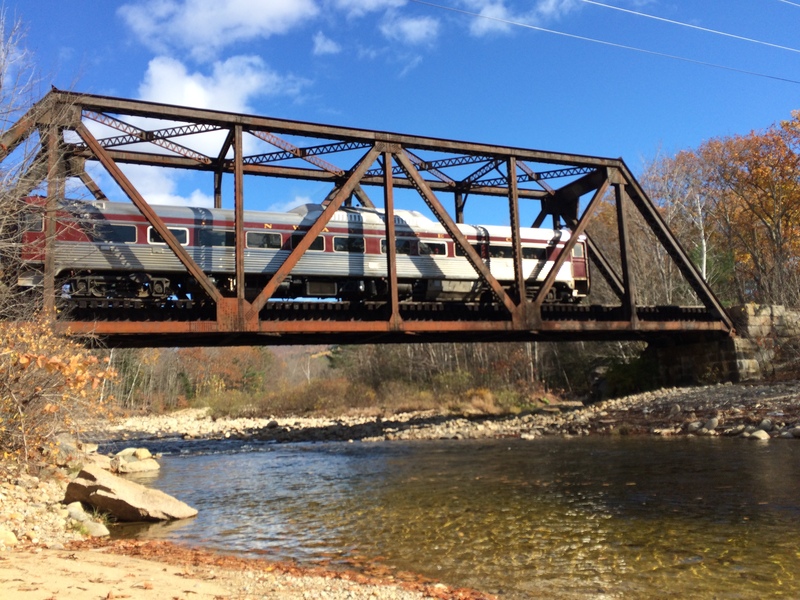 We left the busy parking lot, with most hikers crossing Route 113 to climb the Baldfaces, and dropped down to parallel the Cold River. 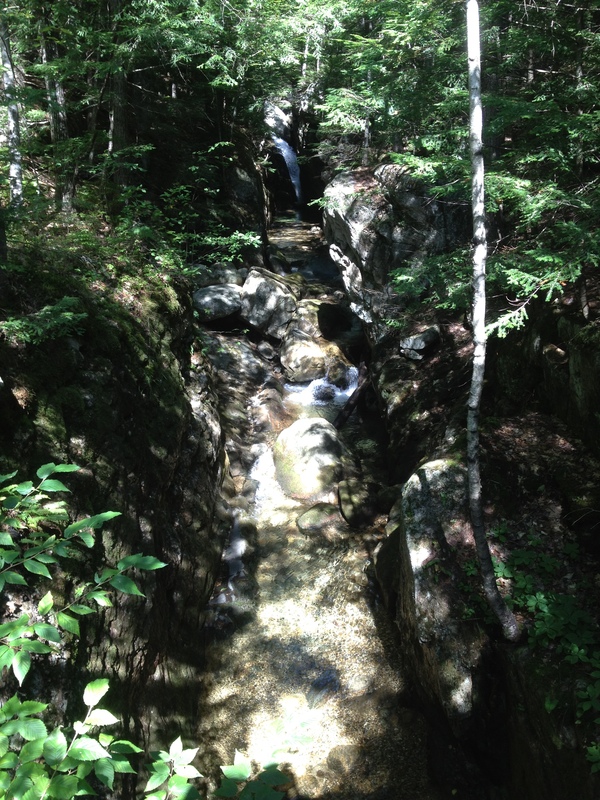 This is a beautiful river that I’ve hiked alongside before. As we worked through the areas recently underwater from high waters we caught up on some family chat. 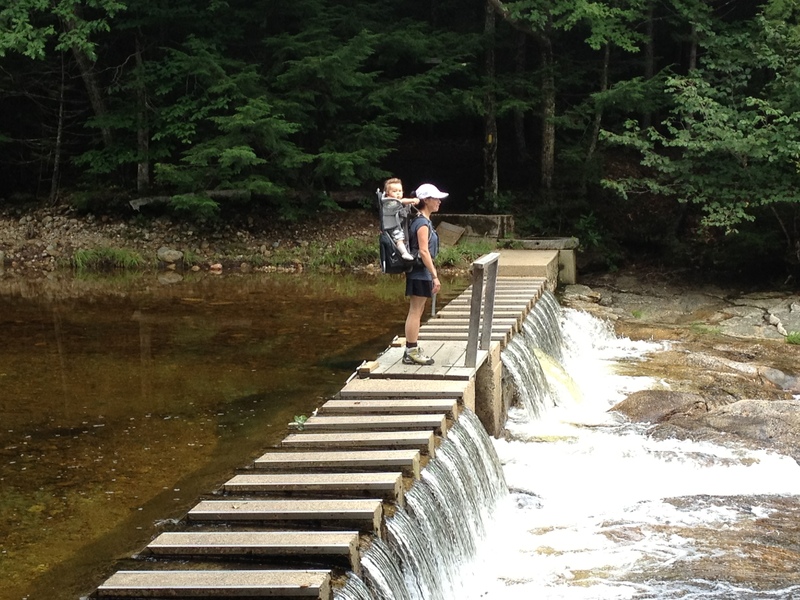 Ten minutes into the hike we came to the Cold River crossing, a scenic dam with dry abutments to make the crossing a snap. As we entered the woods on the other side of the river the trail steepened. We stopped for some water in a small clearing and right before starting again we heard some hikers up ahead descending. This 3 generation family, the youngest a 2 year old boy, would be the only folks we saw on the trail until returning to the almost roadside Cold River a couple hours later. 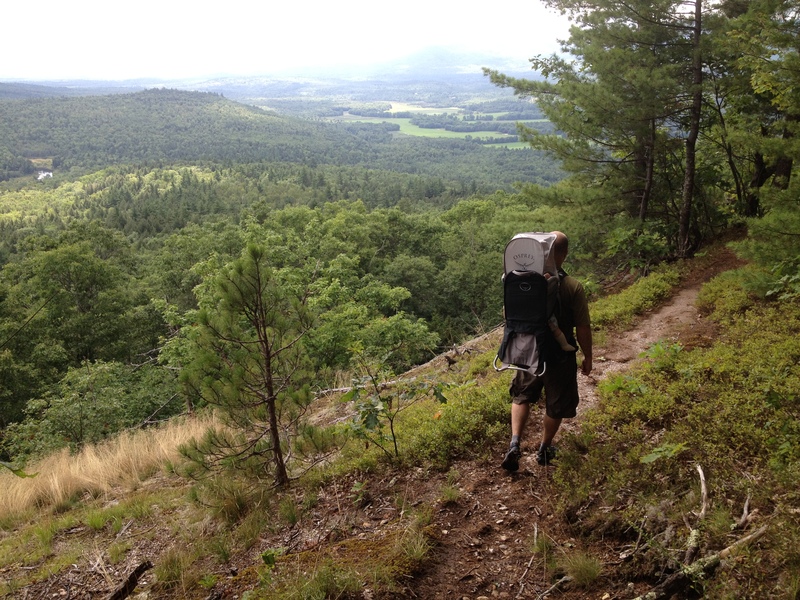 As the trail steepened and became more open and ledgey we traded packs. Michelle enjoyed Alex’s humming and coo’ing while on her back, but preferred I carried him when sure-footed-ness may be required. To be fair, Michelle’s “footed-ness” on the dance floor far surpassed my own, but on a wet mountain trail, I had a bit of an edge. A few minutes later we reached the summit of “Little Deer”. As we dropped down into the col between the two small peaks we talked about the weather forecast. 50% chance of thunderstorms was weighing a bit our minds but with out a rumble in the sky we decided to push on. More pressing than the weather was the mosquitoes which decided to make a pronounced appearance. 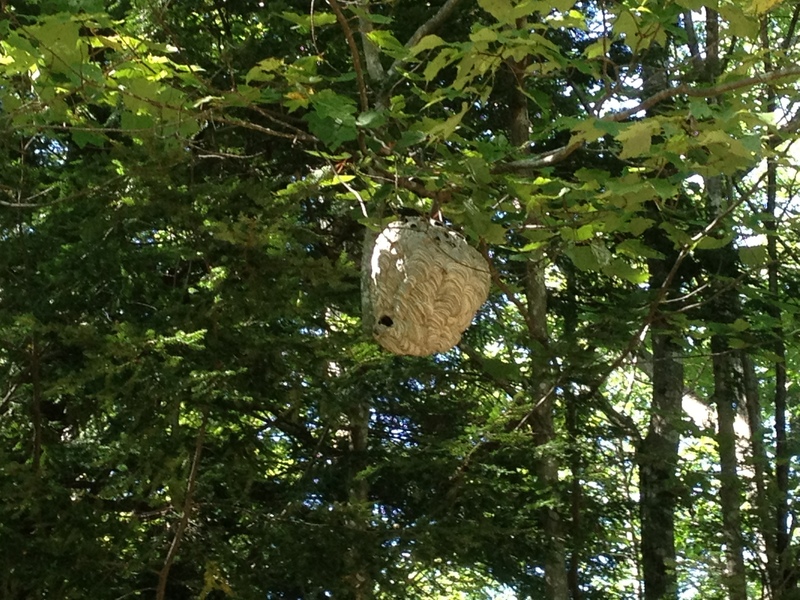 The recent rains had allowed quite a good hatch, and our kid friendly bug repellent was doing little to keep them away from us. My pace was quickened less for concern over afternoon storms and more in a vain attempt to outrun these little blood suckers. Despite Michelle and I suffering some nice bites they seemed to leave Alex alone, which we were quite grateful for. 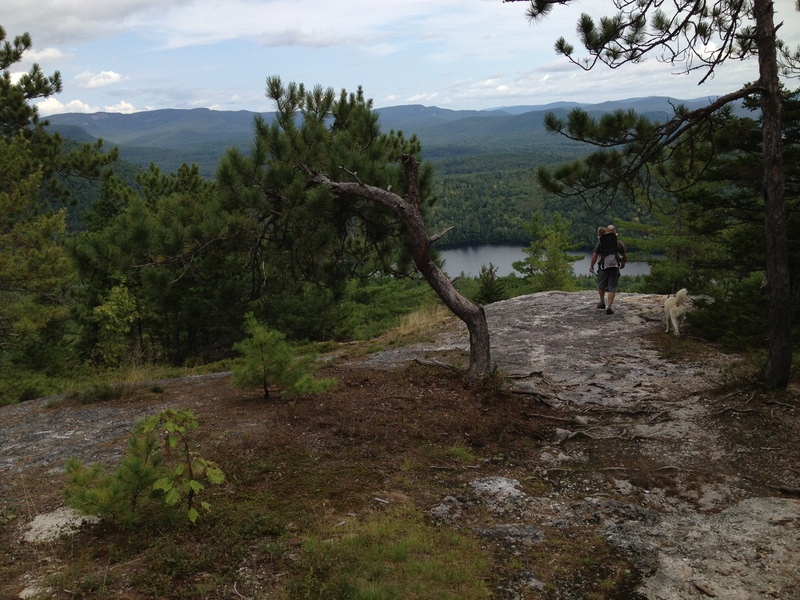 About 25 minutes from leaving Little Deer we reached the treed summit of Big Deer. Eyeing a scenic out look just a few yards to the south we decided we would stop there for snacks and some Alex stretch time. However light rain drops encouraged us to garb a quick photo and start our descent. As the sky lightened any threat of a storm seemed to pass. We agreed that 3* things would make this day perfect. A swim, a burger, and a beer. 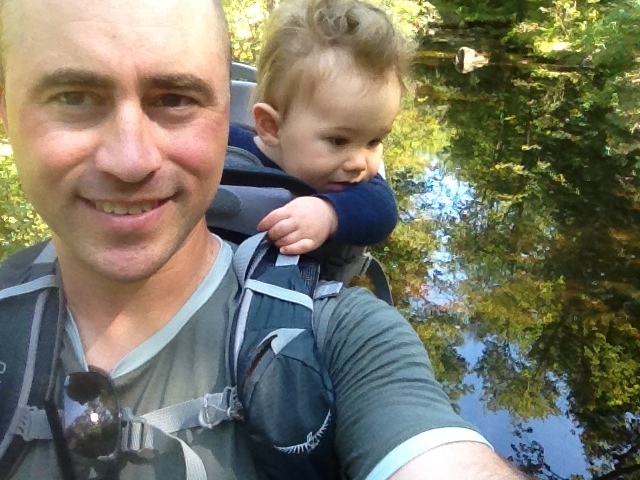 We arrived back at the Cold River Crossing and stopped for a diaper change, some snacks, and a quick swim. 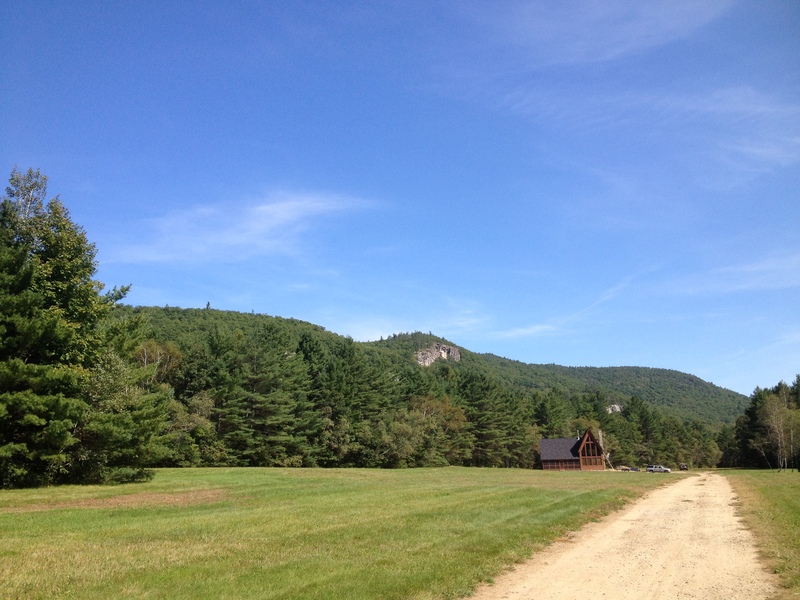 Thing #1 accomplished, we returned to the car and drove towards Fryeburg, stopping at the 302 Roadhouse for things #2 and #3. 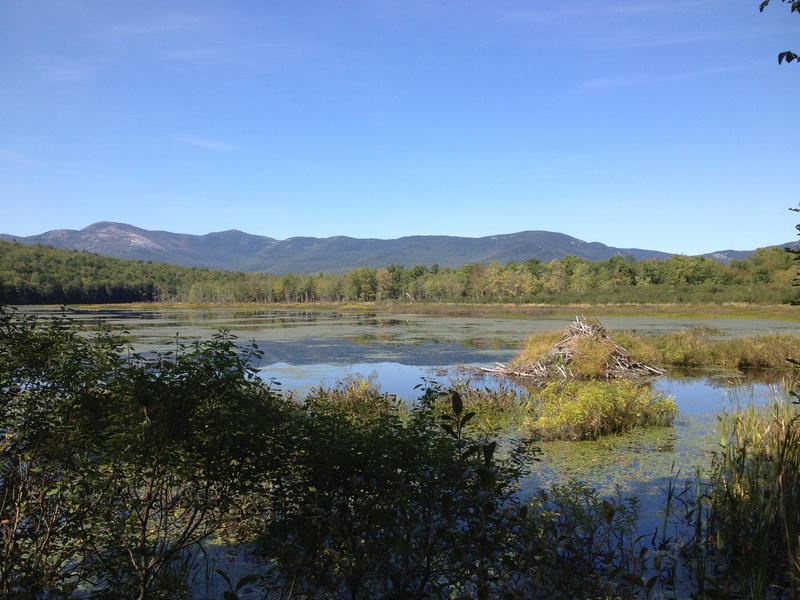 Sitting on the back deck with Alex fast asleep in his carrier we looked over at the Green Hills Preserve and North Moat Mountain as we made plans for a future Moat Range traverse, and tried to determine what could really make this day any better.